This page is about the tank destroyer ARL-44. For the heavy tank version, see ARL-44 (ACL-1). The ARL-44 is a Rank III French tank destroyer with a battle rating of 5.7 (AB/RB/SB). It was introduced in Update 1.75 "La Résistance". As a rank III turreted tank destroyer, it performs very well in its role. It is the final iteration of the ARL-44. With a very good gun and appreciable armour, this tank is deemed to be a long-range sniper on the battlefield. Its only downside lies with its mobility: it is slower than most tanks at this BR. The ARL-44 bears very distinctive characteristics, with a WWI-style track system (similar to the Churchill) which runs across the whole side of its chassis. This tank is a mix of different inspirations, mainly late war German tank technology such as the Panther series or the Tiger II, from which it takes its sloped frontal armour and tall profile. As France was reviving from WW2, its engineers were hard at work to catch up with tank technology, the ARL-44 series was a training ground for them. 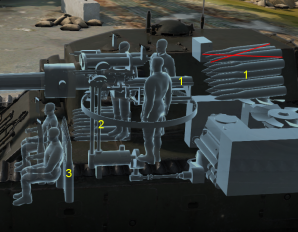 This is why this tank has rather weird design choices, coming from both experience and experimentation. This final iteration of the series is comparable to the famous King Tiger (while being not as good). Distance is your best ally as your armour has many big weak spots. Avoid showing sides and/or back to your enemies and you should be mostly fine. 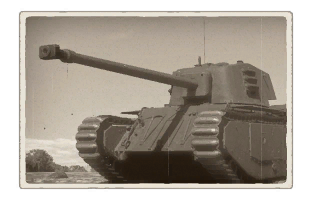 As armour on this tank has very large weak spots, it is better to keep as far as possible from the frontline, using its astonishing gun to knock down enemies. Suspension wheel are 15 mm thick while tracks are 20 mm thick. 25 mm RHA plate separate the engine from the crew compartment. Moving around is the greatest issue an ARL-44 will face: its track traction is very poor and won't allow to move as quickly as you would wish on most terrain. Since your mobility does not make you neither a good flanker nor brawler, keep behind friendly lines, breaking even the heaviest of your foes. The gun is clearly what this tank is all about: taking down anything from a good distance. Keep in mind that your reload rate is rather slow. Every penetrating shot carries a very large amount of shrapnel, hence, destroying enemies with one shot is a frequent occurrence, even if this tanks only has solid shots. Ammo racks on the ARL-44. This tank is a dedicated sniper, using it in any other role is a bad idea as its characteristics does not suits it for anything else. Hull-down positions are mostly ineffective as its turret armour is bad. At best, try to hide its LFP behind solid cover. Angling is not very necessary in most cases it is better to face its enemies head-on and concentrate on the firing. If caught in close-quarter combat, make sure to angle its turret ~30 to the left between shots (thus protecting your ammo racks with gun breech). At this BR, you are not the only good sniper on the battlefield, watch out for SPGs as they can take you out from a very good distance. Still, these are not your biggest fear, armoured SPGs and heavy tanks are. Has 120 mm of sloped armour on the glacis plate. Side armour is complex, negates occasional HEAT shells. Can be played a little like a heavy tank when facing weaker enemies. Vulnerable side profile. Big and flat. There is a shell staying next to breach that won't go away untill all ammo is spent. Shells penetrating the turret and hitting the breach have high chance of blowing it up. 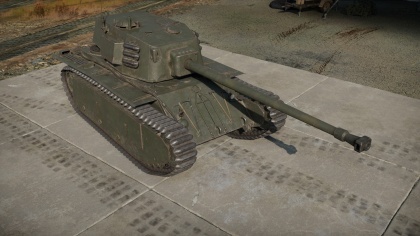 Turret armour is underwhelming at 100mm-110mm of flat armour. German 75mm can penetrate at range. Extremely thin roof armour (10 mm on the turret and 5 mm on the engine deck). Strafing planes are deadly. Weak lower plate is only 50 mm, a major shot trap. Turret back is only 20 mm thick, vulnerable to HMG fire. Struggles when uptiered in matches. Development of the ARL-44 began shortly after the Liberation of France in 1944. The established provisional government was keen on restoring France’s influence and power to what it used to be before the war. This involved, among other things, the revival of all French military branches. The situation was looking particularly desperate for the army, as most indigenous equipment and tanks were manufactured in the 1930s and the most advanced in use at the time was equipment left behind by the Germans. The French Ministry of War decided to remedy this issue by starting the production of a so called “transitional tank”. This project was intended to bolster the number of indigenous tanks in use with the army, reuse existing tank parts and, most importantly, provide French engineers with a base on which they could “experiment” on to gain valuable experience for future tank development. Thus, in November 1944, the decision was made to design a heavy tank with relatively modest specifications. Staff from several design and manufacturing state companies were assigned to the project and work on what would become the ARL-44 began. Initially, the new tank was required, apart from using existing tank parts, to have a weight of 30 tonnes, a top armour thickness of 60mm and a primary gun of the 75mm caliber. As the engineers were limited to using existing parts for their new machine, it very quickly became apparent that the amount of innovation that was possible for the new machine was equally limited. Thus, the ARL-44 soon took on the resemblance of a Char B1, with the exception of the turret and gun. The end of the war in 1945 didn’t stop development however, quite the opposite in fact. The design went through several changes, from increasing the armour thickness to the installation of a new engine and the new 90mm French cannon, despite the fact that there was no longer a for such a vehicle. At that point, the further development and subsequent limited production run of the ARL-44 was only used for “propaganda” purposes, with the aim of increasing the morale of the French people in the post-war period. In the end, only 60 ARL-44s were constructed and no sooner than they were introduced into service, they were also decommissioned due to, unsurprisingly, unsatisfactory performance, at the beginning of the 1950s. Despite this, the project did fulfill one of its major goals - generate experience for a new generation of French tank designers. Thanks to experiences gained from projects like the ARL-44, France would build its first true modern MBT only a decade later, serving as proof that the ARL-44 was not in vain after all. Skin and Camouflages for the ARL-44 in Warthunder Live. This page was last edited on 5 April 2019, at 00:40.